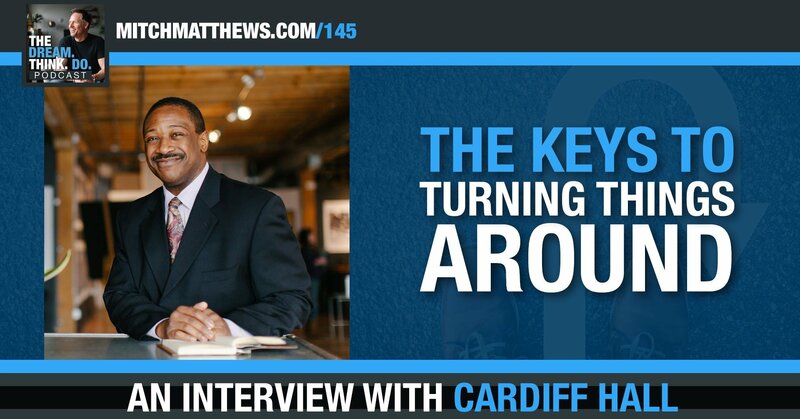 Cardiff Hall | The keys to turning things around! 27 Sep Cardiff Hall | The keys to turning things around! In this episode of the DREAM. THINK. DO. podcast, Mitch Matthews talks with Cardiff D. Hall, inspirational author, speaker, and mentor. He’s recently written the best-selling book Tide Turners: The Practical Guide To Help You Feel In Control, Experience More Joy, And Sustain Achievement In Life. He uses what he has learned from his personal failures to help other with creating strategies for setting goals, overcoming failures, and dealing with stress, so they can turn the tide and create the life they want. Cardiff D. Hall is someone who doesn’t let the waves keep him down. However, it wasn’t always like that for him. Before he reached the age of 30, Cardiff’s accountant told him that he should declare bankruptcy because he was carrying so much debt and the economy had just downturned. Forced to face his financial failure, he decided to learn from this experience and get himself out of that pit. He used his failures as part of his learning process for how to become successful. It was a slow process – but he did it. As my next guest on this episode of DREAM THINK Do, Cardiff teaches listeners how to control the waves of life and be the captain of their own ship. He provides the keys for how you can turn things around if you’re feeling stuck in a pit. You’ll walk away with his top strategies for how to learn from failure, the 3 key steps to setting goals, and how to deal with stress – all strategies that you can start implementing immediately. Awesome episode, as I have come to expect! Keep up the great work! Thank you!